Famous Vada Pav Street Food in Mumbai..!! 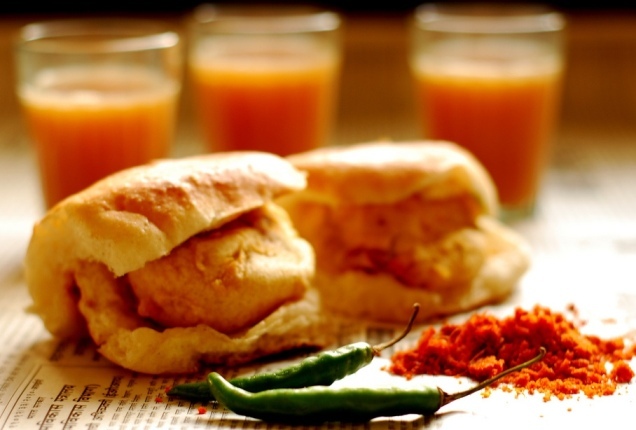 Vada pav is a very famous and loved street food in Mumbai. However, these days, vada pav is not just eaten in Mumbai; rather in different states of India. This is just like a local burger that is served on stalls. If you ask any maharashtrian about his/her favorite dishes, then it is for sure that vada pav would definitely be on the top in his/her list. This snack is certainly a part of maharashtrian culture. This local burger is served with tamarind chutney and is quite spicy. You can even enjoy this with a hot masala tea that will form a perfect combination this winter season. The vada is a ball of mashed potatoes that is deep fried until it turns crispy and golden brown. The softness of the pav and the crunchiness and spiciness of the vada is surely one thing that will make your mouth water. Previous Previous post: Creamy and Cheesy Pasta for Real Food Lovers..!! Next Next post: Rich Tomato Soup or Tamatar Shorba..! !